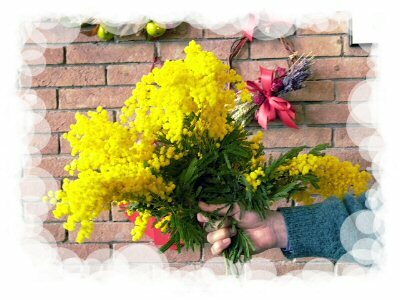 Lorenzo Pasqualis, the Blog: March 8th, "Festa della Donna"
March 8th, "Festa della Donna"
March 8th in Italy is "Festa della Donna" or "Women's day". On this day men in Italy traditionally bring some "Mimosa" to all the women they think they will meet during the day. “Mimosa" is a small yellow flower that grows on Mimosa trees and that blooms right around the beginning of March. It is not uncommon on March 8th to see guys with large boxes full of Mimosa going to work or to school in the morning, ready to distribute the yellow flowers in large quantities. Many people even grow Mimosa trees in their back yard to make sure they have enough flowers on March 8th. I thought many times to bring this tradition to the States and on March 8th go around and give Mimosas; I wonder if that would seem weird. I bet it would; I also bet I woudn't be able to find Mimosas very easily around here. Oh well :) I'll just post a photo for all the women that I know. Happy woman's day! !